Tomato sweetness and intense aroma of herbs? It's the perfect recipe for a homemade ketchup to crunchy pizza! Full of flavor is also delicious as a addition to sandwiches. So aromatic that it’s hard to resist! 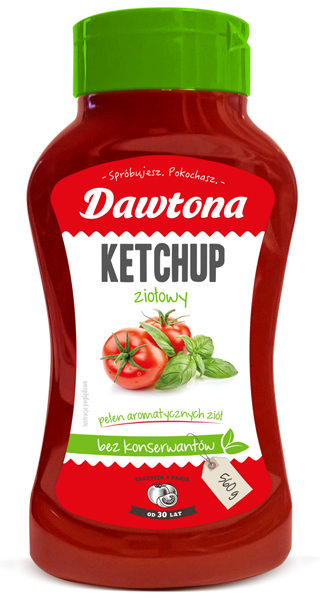 Smelling of oregano and basil Ketchup with Herbs was prepared with 233 g of Polish tomatoes per 100 g of the product,with no preservatives, no food coloring or any flavor enhancers. Product available in 560 g bottle. Do you want to add tomato spiciness to your favourite dishes? Use just a little bit Extremely Spicy Ketchup to course you want to prepare. Juicy grilled pork or a roast chicken – altogether with Hot Spicy Ketchup will taste great! Due to extremely expressive taste is a great treat for fans of spicy food! 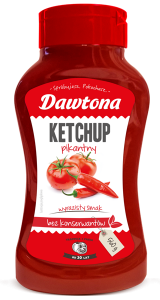 Hot Spicy Ketchup Dawtona with habanero has been prepared with 220 g per 100 g of tomato product, without preservatives, flavor enhancers and any food coloring. Strongly tomato and extremely expressive taste will satisfy enthusiast of spicy add-ons. 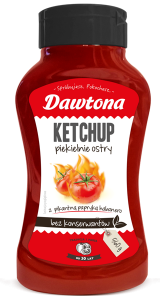 Every 100 g Spicy Tomato Ketchup was prepared of 220 g Polish, juicy tomatoes, perfectly seasoned with a specially composed mixture of spices, contain, among others, chili pepper and black pepper. Juicy tomato and a subtle note of spicy is a fantastic combination which fascinate even the most demanding gourmets. Just take a little bit Spicy Ketchup and every dish will have memorable special character. Tastes perfectly with sandwiches and sausages or grilled meat, as well as in modern Mexican cuisine. For all fans of ketchup, meets the expectations even the most demanding consumers. 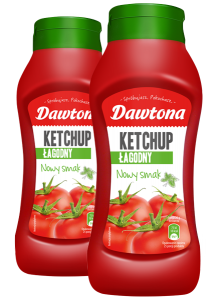 Every 100 g Mild Tomato Ketchup is prepared from 233 g polish and perfectly flavored tomatoes, based on a carefully developed formula, devoid of preservatives, colorings or flavor enhancers. 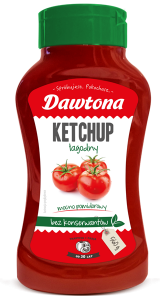 Mild Tomato Ketchup is unusually universal in kitchen. Perfect for sandwiches, sausages, poultry, vegetables, grilled dishes, and many other course. Makes that every dish will taste just delicious. Fans of traditional grilled dishes should reach for classic taste - Tomato BBQ Sauce . This American legend with smoke flavouring blends different flavors - sour, sweet and spicy. It adds character and beef up natural flavor all of dishes. It fits perfectly to meat course - baked, stewed or fried. Product available in 560g bottles. Spicy Curry Sauce is dedicated to all lovers of food with character! 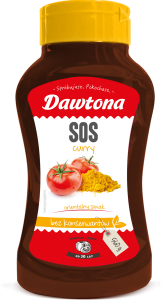 Tomato base in Curry Sauce has been combined with a blend of spices with a variety of flavors of Asian cuisine. Turmeric, coriander, ginger, chili and cardamom - are just a few spices included in the Curry Sause. Oriental flavor of sauce composes in dishes of poultry - chicken or turkey as well as with grilled vegetables. Juicy and full of tomato flavor, it imparts character to any dish. 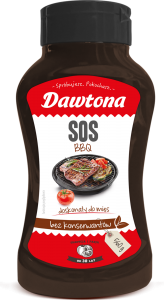 It tastes great on sandwiches, sausages and crispy fries. Product available in 500 g and 750 g bottles. A treat for the amateurs of distinctive flavors! Juicy tomato and a subtle hint spice is a combination that will delight even the most discerning gourmands. Just a little bit of our spicy ketchup imparts real character to any dish. It works both as an addition to the classic grilled cheese sandwich, as well as in contemporary Mexican cuisine. Product available in 500 g and 750 g packaging.